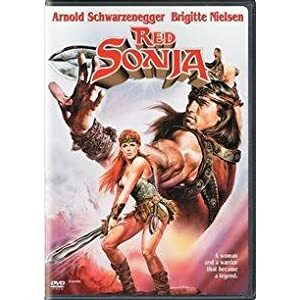 Red Sonja is a sword and sorcery adventure story - and a bargain on DVD. The film stars Brigitte Nielsen as Red Sonja, and Arnold Schwarzenegger as Kalidor. Red Sonja is off to avenge the death of her family. The movie has lots of action, but much less graphic violence than Conan the Barbarian. The violence is more watered down, like in the second Conan movie (which has a PG rating). For guys who love fantasy and adventure movies, it's definitely worth watching. At the time of this writing, the price is just under $5 US. It's hard to pass up a bargain like that.